Tiny burgers top RITZ crackers to make our Mini Cracker Turkey Sliders. 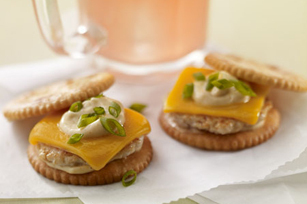 Try these turkey sliders today—they're crowd-pleasing, full-flavored finger food. Mix turkey, garlic and mustard just until blended; shape into 20 (1-1/4-inch-thick) patties. Heat oil in large nonstick skillet on medium heat. Add turkey patties, in batches; cook, 2 to 3 min. on each side or until done. Remove from skillet. Mix mayo and peppers until blended. Spread 1/2 tsp. mayo mixture onto each of 20 crackers; place on baking sheet. Top with turkey burgers and cheese. Bake 3 to 5 min. or until cheese is melted. Top with remaining mayo mixture, onions and remaining crackers to make 20 sandwiches. Serve with a cold glass of prepared CRYSTAL LIGHT Pink Lemonade.